Greetings! My name is Arthur Cook. My passion for the piano started at a very young age when I began to notice similarities between notes on the family piano (an old 1920’s upright) and the sounds I heard on recordings and movies. I began picking out tunes by ear on the keyboard, my favorite of which was the first I ever learned; the theme to Star Wars by John Williams. I took lessons all through my childhood and when I was in high school I was introduced to some older piano technicians who began to share the secrets of the trade with me. My imagination was lit up by the idea of becoming someone who could turn an out of tune, malfunctioning piano into something beautiful once again. I have spent the last 18 yrs. working to master the art of piano tuning. I joined the Piano Technicians Guild and in 2004 I passed the exams to become a Registered Piano Technician. In 2010 I had the privilege of serving as the president of the Piano Technicians Guild, Grand Rapids Chapter. Currently, I am blessed to be able to service pianos for many churches, schools, colleges, and homes all over Mid-Michigan. Being a piano technician has officially been a trade since the early 1800’s, and I am proud to be a part of such a long-standing tradition. 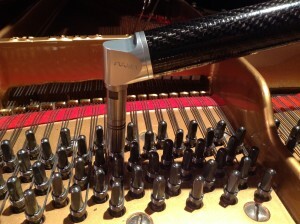 I am dedicated to upholding the highest standard of quality and integrity, and to providing comprehensive piano care. Let me help you get the most out of your piano.